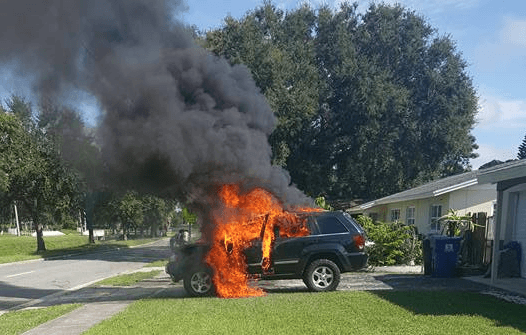 Following numerous reports of exploding batteries, Samsung might have a huge Galaxy Note 7 emergency on its hands as a man from Florida claims his phone blew up, setting his car on fire. According to a report from FOX 13 News, the incident took place this Monday shortly after Nathan Dornacher and his family returned from a from a yard sale. The Note 7 owner left his device in the family jeep to move some furniture, but by the time he came back, the vehicle had already caught flames. Firefighters were quick to put out the fire, but the but they still were too late, and the car was a write-off. Commenting on the incident, Dornacher said in a Facebook post that his Note 7 was charging when the vehicle caught on fire. This marks the second Note 7-related incident following Samsung’s mass recall. Earlier this week another device exploded, causing over $1,400 in damages to a hotel room in Australia.